As temperatures fall and snow piles up in Wisconsin, our thoughts turn to outdoor winter activities. Since skiing is far more appealing than shoveling, we thought it would be a great time to spotlight a Pivot Point customer in the ski equipment market that uses our popular SLIC Pin™ in their ski bindings. Twenty Two Designs of Driggs, Idaho manufactures world–class Telemark ski bindings. The company is named for Wyoming Highway 22, which travels over the Teton Pass — one of America’s most attractive backcountry skiing spots. The company was founded in 2004 by Collins Pringle and Chris Valiante, both experienced skiers and mechanical engineers. They have used their unique combination of experience and engineering to design and build what they view as the best Telemark bindings in the world. Telemark skiing, named after Norway’s Telemark region, uses equipment similar to cross-country skiing with ski bindings that have a ski boot attached only at the toe. However, Telemark skiing is more rigorous than cross country skiing and requires stronger, more robust equipment. This is where Twenty Two Designs shines: their Axl and Vice bindings boast advanced design and toughness that can stand up to the rigors of Telemark skiing. 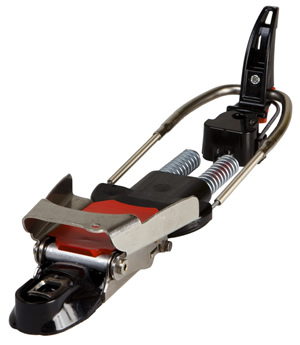 The bindings’ performance is enhanced by the ability to adjust the tension, or “flex.” This is achieved with Pivot Point’s unique SLIC Pin — a quick-locking pin that combines a pin and cotter all in one. The SLIC Pin can be quickly and easily inserted into any of three adjustment holes, each offering a different degree of flex in the binding. Twenty Two Designs previously used a spring button in this application, until they discovered the SLIC Pin. “Spring buttons were difficult to work with in snow and with gloves on,” says Twenty Two Designs founder Collins Pringle. “The SLIC Pin is much better because it inserts easily – it’s perfect.” The company had experimented with a bolt and nut, but contacted Pivot Point and spoke with design engineer Romy Baus about using the SLIC Pin. Pivot Point made samples, and testing was successfully completed. “Romy was super helpful, especially with the various modifications that we made as we developed this,” Collins says. “If it weren’t for the SLIC Pin, we’d probably be using a bolt and nut or some type of cotter pin,” he notes. If you’re looking for a strong and secure quick-locking pin, check out SLIC Pins! Watch our quick video and you’ll see why this is one SLIC Pin, as seen on Engineering Newswire, compliments of Product Design and Development Magazine.